We try to avoid tourist traps as much as possible (unless they are Castles!) but we decided to stop at Volendam as we were passing it anyway and we fancied a swim at the beach. Volendam is right on the East coast of the west bit of the Netherlands. Confused?? Here's a map to help. If you click on the map on our homepage or in the sidebar, it will show you more details. 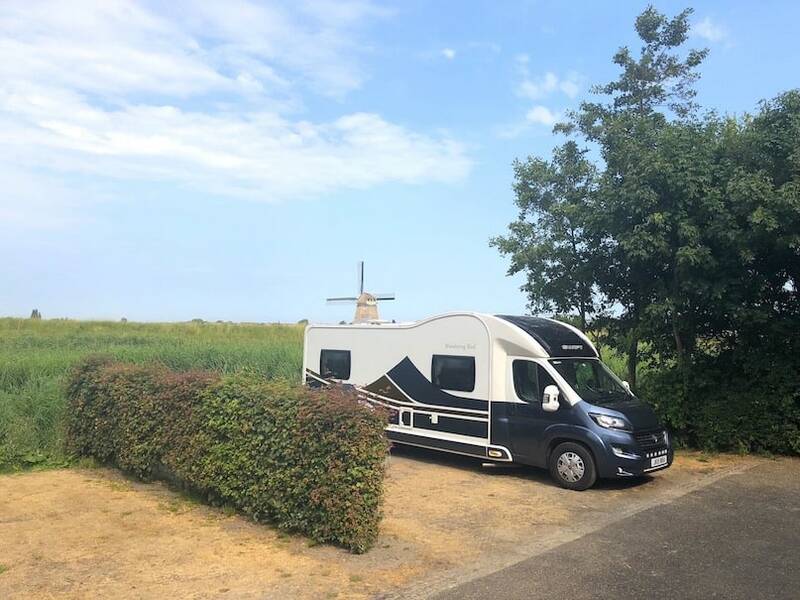 Volendam is about 40 minutes north-east of Amsterdam and looks out onto the bay of Markemeer- which is huge and very pretty- perfect for sailing, kayaking, paddleboarding or swimming. It's also just down the road from Edam (yep, where the cheese comes from). In fact, Volendam used to be the harbour for Edam, until a new harbour was built about 600 years ago. It's a very pretty village filled with quaint wooden houses and shops set around a fishing harbour. There is also a more modern harbour and a swimming beach with sand. After the need for a port of cheese was removed, (see what I did there? Port….cheese… mmmmm. Sorry, sorry. I'm back), the Dutch built a dam across the harbour and started to reclaim the land. Volendam literally means Filled dam. Fishermen and farmers settled there- and it's still used for that to this day, although between you and me I don't know how much fishing they actually do and how much is for show for the tourists- there were a lot of pretty fishing boats in the harbour and not much activity whilst we were there!! Volendam is very strongly linked with the Catholic Church, with many missionaries & bishops growing up here. You'll see a lot of religious statues and such in the windows of houses as you pass by. Weirdly, it is also an artist retreat- Picasso and Renoir both spent time here. Those worlds rarely mix, so it intrigued us. Price: 14€/night, or 6€ for the day…. but we arrived at about 10am, stayed all day and then all night and were only charged 14€. It's got wide pitches, all facilities, electric included- there's even a laundrette about a 3-minute walk away. Parking here is a little confusing- you pull in through the barrier and pick your spot. TIP- the black waste disposal is immediately down the row to the left as you pull in. If you can, avoid that row- you'll get a LOT of vans and smell. Also, avoid the row behind if possible for the same reason. We went down the row at the back right… but it's by a small stream and the midges were HORRENDOUS. If (when) we return, we'll go in the first right row. Anyway, once you've parked, go off and enjoy yourself. You don't pay anyone anything until later in the evening, when a guy comes around anywhere between 9pm-10.30pm! He takes cash or card and will give you a sticker to display in your windscreen. He also takes note of your vehicle registration so that you can get out of the barrier. I think he's linked to the marina somehow, so you can possibly contact them if you want to leave earlier. I believe there is an option for short-stay parking in the marina car park if you only want to stay for a few hours. You can definitely get a taste of Volendam in just a few hours. The parking is about a 10-15 minute walk into the ‘old town'- or you can cycle if you have bikes. You also need to see the woman in traditional dress. You know those pictures of Dutch women in pointy hats?? That's the local Volendam costume. Apparently, there are still a few (elderly) members of the community who dress like that on a daily basis, but if you don't happen to see them, you can find the statue on the harbourfront. If it's lifesize (and I think it is!) those women are TINY. There are also many boats in the harbour offering tours- either for an hour or a day trip. Many of them can be booked there and then- so you can wait and see what the weather is like! But honestly, our favourite part was the swimming beach, about a 5-minute walk from the motorhome parking. The sand was soft, the water was crystal clear and we sat for several hours as the sun set, just chatting, people watching and drinking beer. It was such a gorgeous way to spend a few hours- and I wish we'd stayed there an extra day or two- just to enjoy that chilled out vibe. Next stop for us is Giethoorn- the village with no roads. Seems like an excellent place to take a motorhome…. Volendam beach- our favourite beach so far! Have YOU ever been to Volendam? What did you like best? ?